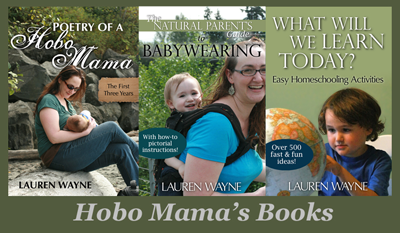 Hobo Mama: Giveaway for a GE LED $50 bulb and green home energy tips at Hobo Mama Reviews! Let me be forthright and say I would have a lot of trouble forking over that kind of dough for a lightbulb (probably because I somehow keep breaking these CFLs that are supposed to last 9 years! ), so you might as well try to win one and see what it's like, right? I had a fun time writing up the ways we've (a) changed our energy use, (b) want to change our energy use, and (c) can't change our energy use. Ok, that last one might have gone a bit wistful and/or whiny, but it is disappointing to find out you're not the Energy Super(wo)man, because you don't, in fact, have all the money in the world or magical powers to change your electric heat to gas. Now that I think of it, that really would just take money, not so much magical powers. Also, fair warning, I can't put the review on this site, because it has to be on an ad-free site per BlogHer's rules. But, since this is my "real" site, I have to tell you about it here at least twice a week while the contest runs, through the end of the month. So if you don't like hearing about giveaways, put your fingers in your ears and chant "la la la I can't hear you" — but only twice a week. I'm already getting so many good tips from the people who've entered the GE giveaway so far. I'm definitely adopting some more for use in my home! Now go green your home & tell me how you're doing it! Disclosure: BlogHer and GE sponsored the review post. Chant, "La la la, I can't hear you!" - love it. Well, at least the giveaway you're promoting is for a pretty incredible cause. Isn't there an increased hazard with breaking these special, environment-friendly light bulbs? @Brynn There is! That's another reason it's so aggravating. It's the mercury in CFLs. http://www.snopes.com/medical/toxins/cfl.asp Fortunately, LED bulbs don't have mercury, so the giveaway bulb should be safe (though I'd still be sad if I broke it! ).